EastWest Pancake House Treats ~ Philippine Freebies, Promos, Contests and MORE! 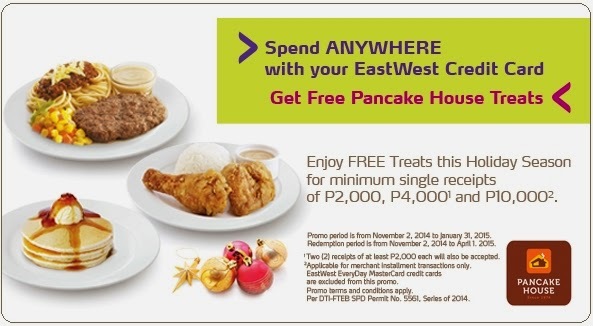 This holiday season, spend as much as you can using your EastWest credit card and get FREE Pancake House Treats! For a minimum single-receipt, straight and retail transaction of P2,000, choose between Mini Classic Pancakes, Best Taco in Town, or Regular Milkshake. A single or accumulated purchase worth P4,000 will give you 2 pcs. Pancake, Arroz a la Cubana, 2 pcs. Classic Pan Chicken, or Fiesta Taco Salad. Spend as high as P10,000 on merchant installment transaction and enjoy any two (2) Filipino Favorites (Pork Tocino, Longganisa, Beef Tapa, Smoked Golden Tinapa, or Daing na Bangus) or any two (2) of these yummy sets: Spaghetti Club Special Set, Hamburger Steak Special Set, or Roast Beef Special Set. Take advantage of this perk and enjoy redeeming up to three (3) FREE Pancake House treats per card, per day, per store.